Specimen Retrieval Market by Bag Size (5, 10, 15, 25 mm), Type (Detachable, Non-detachable), Application (Gynecology, Urology, Gastrointestinal Surgery), End User (Hospitals, Ambulatory Surgical Centers, Nursing Home) & Geography"
The specimen retrieval systems market is projected to reach USD 290 million by 2024 from USD 230 million in 2019, at a CAGR of 4.7% during the forecast period. Growth in this market is mainly driven by the increasing prevalence of diseases requiring surgical treatment, especially laparoscopic surgeries. However, the high cost of specimen retrieval systems is a major challenge for this market, particularly in emerging countries. 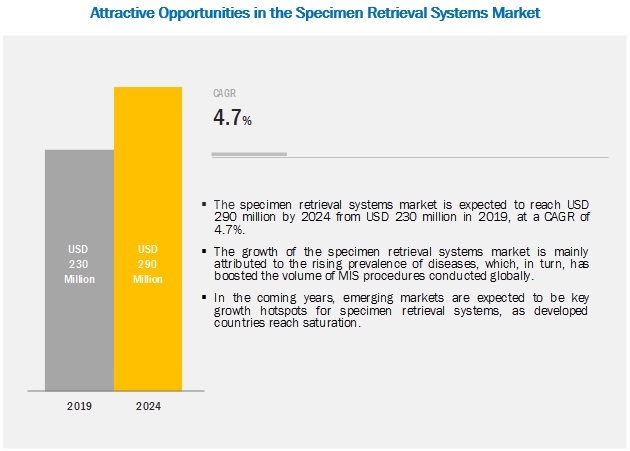 Some of the prominent players in the specimen retrieval systems market are Johnson & Johnson Services, Inc. (US), Teleflex Incorporated (US), Applied Medical Resources Corporation (US), CONMED Corporation (US), Cooper Surgical, Inc. (US), Genicon (US), B. Braun Melsungen AG (Germany), Laprosurge (UK), Purple Surgical (UK) and Medtronic (Ireland). Based on application, the specimen retrieval systems market is segmented into gastrointestinal surgery, gynecological surgery, urological surgery, and other applications such as cardiovascular and bariatric applications. The gastrointestinal surgery segment is anticipated to drive growth in the market at a CAGR of 6.2% over the forecast period. This growth can be attributed to the increase in the incidence of gastrointestinal diseases such as appendicitis, and gallstones. Additionally, with technological advancements in gastrointestinal robotic surgery, the demand for specimen retrieval systems is anticipated to increase. In 2017, B. Braun opened five new production and administration facilities in Penang to cater to end users in Malaysia. The company aims to manufacture medical devices for infusion therapy, pharmaceutical solutions, and surgical instruments in these facilities.